Headlong Dance was formed in 1993 by Co-Directors David Brick, Andrew Simonet and Amy Smith. Their movement backgrounds include modern, ballet, jazz, tap, contact improvisation, theater, sports, sign language, Bharata Natyam, and Ghanaian dance. Over the past twenty years, Headlong has created over forty dances and they have performed nationally and internationally to a range of audiences. The 2013 Festival will feature a performance entitled Red Rovers, choreographed by Headlong Dance Theater. It positions the spectator as a Jet Propulsion Laboratories employee attending a professional conference on the rover mission to Mars. The beautifully disjunctive narrative of Red Rovers concerns a romance gone south between the conference session leaders. The impotency of communication attempts is articulated through robotic rovers aimlessly trekking across the stage, a Ziggy Stardust soundtrack, Gary Cooper mutely romancing a silent film starlet, and the haunting sight of a lone astronaut dancing en pointe in a space suit. The 2013 IngenuityFest will be welcoming back George Kozmon to do a weekend long performance. Known for his large scale paintings, Kozmon will be painting a panoramic monumental image, measuring 8’ x 80’, on-site. The space will be a depiction of alpine tundra consisting of snow, ice, rock, and a cloud-dominated vista. The audience will witness the development and evolution of the image, even though a large amount of preparatory work will have begun on the canvas prior to the festival. Already Kozmon has been drawing up multiple drafts by sketching and working on photoshop. Kozmon is a Cleveland native who enjoys working on large compositions. Scale has always been an important aspect of his work whether it be 600 square feet or just a couple of square inches of space. When asked to define the concept of “ingenuity” Kozmon stated, “I think it’s not necessarily the invention of an idea, it’s more of an elaboration of an idea, putting an alternative use to an idea. Taking things that people might do in their own particular realm and recontextualizing.” Furthermore, Kozmon is excited to be working in an atypical venue. ..and they’re playing Ingenuity! There’s nothing that screams rustbelt renaissance than three highly trained musicians playing in an old warehouse on the lake next to a circus tent. Let’s pack the house for these guys at 2PM on Saturday of the Fest. They’re on the Roadhouse stage. Don’t miss it! Ever wonder about the internal workings of a camera? Find out at this year’s IngenuityFest! Artist, Stephen Takacs is creating Target Six-16. Target Six-16 is a modular, room-sized camera obscura that functions as an immersive art installation, as a functioning image-making device and a didactic tool. 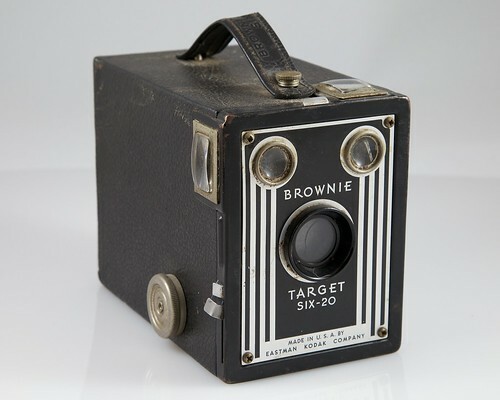 Physically, this piece is a to-scale replica of an iconic Kodak Brownie box camera that has been enlarged 18.5 times to a footprint of 5’ 3” x 8’ 5”, and a height of 8’. Viewers of Target Six-16 are encouraged to enter the installation through an opening in the rear of piece and experience the internal workings of the image capture device. On the front of the camera is a lens and a small infrared sensor connected to the camera shutter. When the sensor is activated by motion, it opens the shutter allowing light to enter inside of camera via the lens. The cameras lens projects an upside-down image of the exterior onto a large spool of thin transparent fabric in the interior of the camera. Within this camera obscura, the everyday world is re-contextualized by literally turning the perception of the world upside-down. By entering inside of Target Six-16, participants are simultaneously captured by, and become, the capture device. As viewers on the outside observe the object, they simultaneously become the object. This inversion and simultaneous juxtaposition of the role of the viewer and the viewed presents a definitive challenge to the standard art viewing experience. Increasingly, we are living, working, and playing in a world not rooted on the ground. Cloud-based technology allows us to move more easily and access huge amounts of data, but how is it changing our lives. Is it always for the better. And how much of our trust, as human beings, are we putting in this network. We have a panel of technologists, artists, and representatives of community groups to discuss this topic. There are photos, directions and info on this year’s event.y 3 this year. Remember, last year’s first two levels sold out so buy early and often to avoid disappointment!